Posted on May 12, 2013 by Amanda C.
Mr. Pirate asked the other night what I would like for Mother’s Day this year. Flowers. Just a little hanging basket of petunias to put out in the yard and attempt to not kill. It’s my first Mother’s Day as a mom and although growing up my family always had the attitude that you didn’t wait for a holiday to tell someone they are important to you, it’s still kind of nice to have time set aside to say these things out loud. My mom has always made finding gifts for her at birthdays and holidays difficult. She doesn’t like chocolate all that much. She’s a minimalist when it comes to accessorizing. She just doesn’t really go in for stuff. She’s an actions speak louder than words kind of lady. I remember being 8 or 9 and wanting to make my mom breakfast in bed as a special treat. Never mind that she eats her breakfast standing up at the kitchen counter. Totally disregard the fact that the breakfast I prepared was my idea of the perfect breakfast: buttered toast with cinnamon and sugar with a side of cold cereal. Mum’s daily breakfast? Yogurt or maybe hot cereal in the winter. I didn’t have the diligence as a kid to actually get up before my parents on weekends, so I probably coerced her to get back in bed so that I could bring her a tray with breakfast. I wanted to make her feel special. Even though I had a very limited skill set in the kitchen I wanted to thank her for all of the daily things that she did to make me feel special. Things like, singing me to bed every night until I was in middle school (I secretly missed it when she stopped but was too much of a teenager to say so). Or letting me hold our dog’s leash when we went for walks. It’s silly, but that made me feel like she trusted me. Even when our schipperke would dash ahead and nearly tug the leash out of my hand. Mum let me know that I was capable of handling responsibility and stout energetic dogs. Had my younger self really wanted to surprise my mom, I’d have prepared for her the ultimate breakfast, leftover pie. The joy of leftover dessert as breakfast is another thing I learned from my mom. The day after a holiday meant that anything was fair game for breakfast. Even pie. My parents are visiting from out-of-state this weekend to visit Elle for the first time. This afternoon I’m going to make her a Be-bop a Rhee-bop Rhubarb Pie. It won’t be leftover pie for breakfast today, but it will be ready for tomorrow which ought to do the trick. Maybe the sentiment on Mother’s Day is sappy, but I still think it’s worthwhile to take the time to show someone what they mean to you. Even if it is just a drop in the bucket in comparison to raising someone. Posted in life ehgo, noms and tagged Be-bop a Rhee-bop Rhubarb Pie, dessert, family, memories, Mother's Day, strawberry rhubarb pie, tribute piece. Bookmark the permalink. 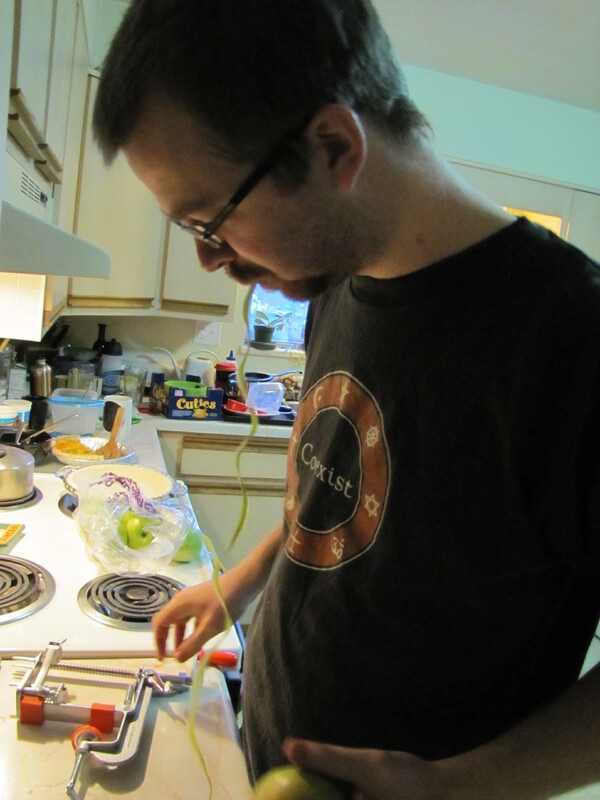 In celebration of Pi Day tomorrow we made an apple pie tonight and relished in the joy of kitchen gadgets. 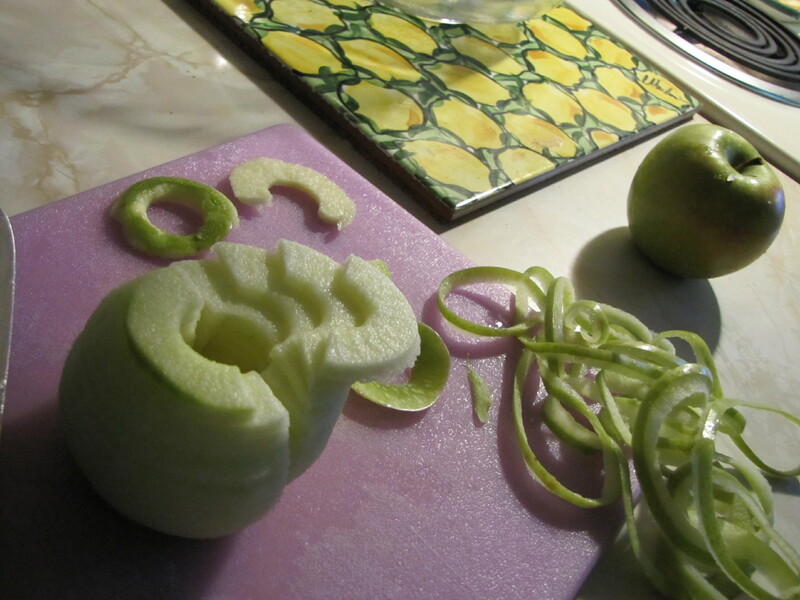 Last year my mom sent us an all-in-one apple corer, peeler and slicer. And I had no idea what to do with it. The obvious answer is to make apple pie. So now, almost a year later, we made pie. Owen enjoyed the new gadget. Particularly the part where the thing yielded instant treats. There’s no crust on the top and the crust is in fact, bound to be inferior since I neglected to call my dad and ask him for his recipe. But we’ll find out. Worst that can happen is that we unmake the universe. I promise not to let you down, Carl Sagan. Posted in noms and tagged apple pie, gadgets, Pi Day. Bookmark the permalink. Sometimes I feel like I did not truly experience the South. Tonight, as I chow down on delectable barbecue courtesy of some other displaced Southerners, is one of those times. Sure, I grew up in Virginia, but Northern Virginia is not really the South. It’s the Diet Coke version of Southern life. Don’t get me wrong. Manassas was one of the best places to have lived as a kid. But I did not live in the South until I moved to Georgia after college. Then I gained a full understanding of the wonderful conglomerate that is urban Atlanta and it’s suburbs (bless their dear sweet hearts). It’s the cooking that I developed a taste for while working as one of the paper’s food reporters. It’s the fact that Sweet Tea is really the only way to drink iced tea. And it’s knowing that grits and GRITS are two remarkably dissimilar and identical concepts at the same time. One being a hot dish served with butter or cheese that resembles cream of wheat and the other being the acronym, Girls Raised In The South. Both are an acquired taste. When we moved here to Colorado, I thought I had passed a time in my life where I would no longer need the comfort foods of my former humid home. Oh no. 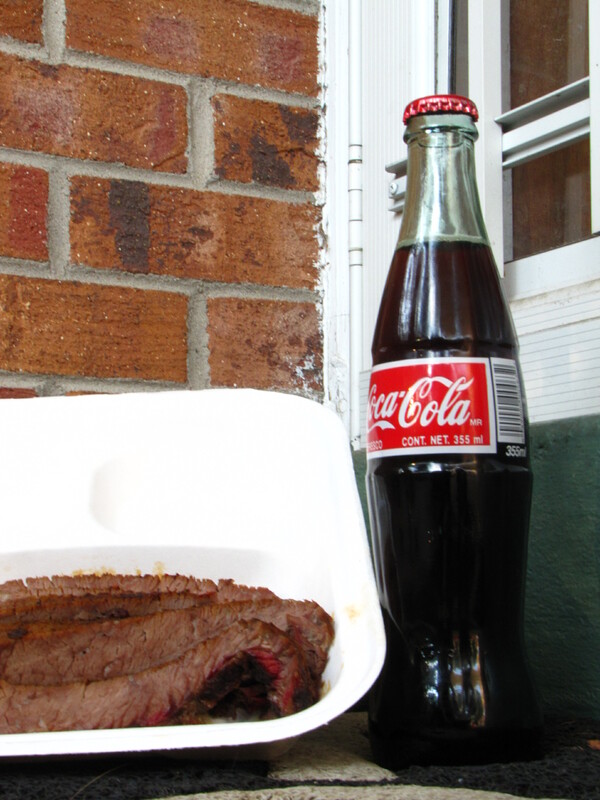 Once you’ve had barbecue done right it is impossible to accept substitutes. And that my friends, is where Georgia Boys BBQ Company comes into the picture. They’re the Front Range’s solution for meaty Southern soulfood. So far I haven’t been able to get beyond their brisket, which even though my sister would probably protest is “too pink,” is seriously hog heaven. At least it’s where I hope the good piggy’s get to go. In addition to barbecue staples such as pulled pork and pulled chicken, they also have a mean selection of sides including coleslaw, barbecue beans and Taters n’gravy. Tonight, I sampled the sweet potato casserole. As near as I can tell it’s sweet potatoes, pecans, brown sugar and melt in your mouth kind of awesome. No matter what makes up the casserole I like to think that it was like a healthy dessert. See. I can eat well and get my soulfood too. I still think I’ll pass on the grits though. Posted in noms and tagged Georgia Boys BBQ, restaurant review, Southern cooking. Bookmark the permalink.